Posted on November 22, 2018 by Emily Allbon. Thursday, December 6th from 6-9PM in C309. City alumni now working in the legal field will be coming in for a panel discussion and networking event! This event will give attendees exclusive exposure to top City graduates, privileged insight into their firm and can boost Vacation Scheme and Training Contract applications. Wednesday, December 5, 2018 at 6:30-11PM in the Royal Garden Hotel – York Suite. 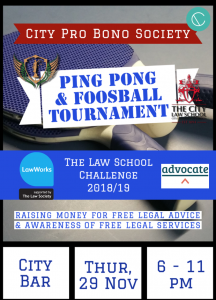 Kindly sponsored by Clyde & Co and Reed Smith who will be giving talks, along with guests from Bryan Cave Leighton Paisner, DLA Piper, and Penningtons Manches, with further firms and chambers still to be announced. Our range of speakers will be discussing diversity in their firms and how they have overcome adversity to succeed in the legal profession. You will have ample opportunity to network over complimentary canapés and prosecco whilst gaining unique insights into these leading law firms that are sure to strengthen your vacation scheme or training contract applications. Also worth noting is the fundraiser ping pong and foosball tournament at the end of this month (see poster! ).